As dementia develops and progresses, people often begin to have difficulty with their daily hygiene. For some, that difficulty may be one of the earlier signs of dementia. For example, you might notice that lately your Aunt Sally is looking unkempt. Her hair isn't styled as well as it usually is, and her makeup, which normally is tastefully done, is either non-existent or overdone. Some people with dementia refuse to bathe regularly as Alzheimer's or another dementia progresses into the middle stages. A lack of bathing may cause offensive odors as well as skin breakdown and discomfort. Dressing is often a challenge for those with dementia. From wearing the same clothes every day to mismatched or inappropriate for the weather clothing to an inability to get dressed- all of these may occur in someone with dementia. Problems with hair care may include a lack of washing it as well as the absence of styling it or simply combing it. This certainly doesn't mean that if a person doesn't do their hair nicely, they have Alzheimer's. Rather, if having a nice hair style has been important to them and you notice a decline in that area, Alzheimer's may be to blame. Sometimes people with dementia aren't aware that they need a bath or that they have an offensive odor. They may forget to use deodorant and sometimes, the ability to detect or correctly interpret odors declines. 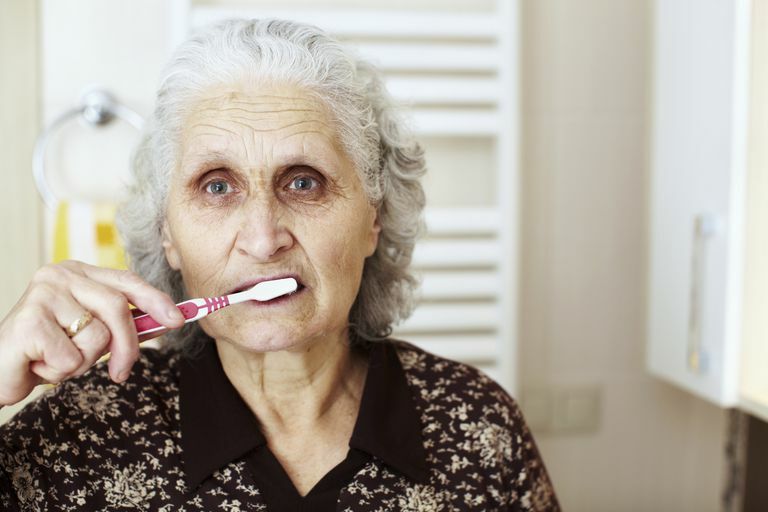 Remembering to brush his teeth might become a challenge for your loved one with dementia. His teeth might become dirty and breath offensive due to a lack of dental care. Finger or toe nails may become long and unclean without regular care. Nail care is important because uncared for nails can breed infections and cause pain. Some people with dementia will forget to shave regularly, or are unable to shave without a high risk of cutting themselves. Sometimes, it may seem there is just no winning when the battle develops about taking a bath or changing clothes. But these nine tips may help reduce the feeling of being on opposing teams. Use the "Doctor said!" strategy. Ask the physician to write an order for a bath or shower every Tuesday and Saturday. The days you choose should be as close to what the person may have done prior to developing dementia, if possible. Sometimes, that written order can become the "bad guy" that makes your loved one take a bath instead of you taking on that role. Consider enlisting the help of a podiatrist. Toe nail cutting can become difficult as people age, and a podiatrist may be able to provide the needed assistance. Switch earlier rather than later to an electric razor which is easier to use and poses less of a safety concern. If appropriate, model the task along side your loved one. For example, as you're handing your mother her deodorant to put on, put your own on. Chat a bit about it- how "it'll help us smell nice and not be too sweaty." Has your mom always loved going to the salon and having her hair done? Then keep those appointments, or make it as similar to a salon experience as possible. If that's the routine every day, it might be maintained longer than if there was no rhythm to the day. Clearly, this strategy is more helpful if the person is forgetful but compliant, as opposed to a loved one who is completely resistive to attempts to help with these issues. Does your brother seem to be able to get your dad to agree to almost anything? Then enlist his help in the highest priority hygiene and grooming tasks. Sometimes, what you hope to have happen just isn't going to be accomplished on a particular day, and letting it go is your best bet. And, occasionally what was completely resisted at first may now be totally acceptable a half an hour later. Hygiene and grooming are important but so is the overall well-being of both you and your loved one. You probably know how good humor is for you. Well, that applies in these situations as well. Humor can help both you and your loved one through the challenges. Be silly together or laugh about an old joke. While you never would want to laugh at your loved one, humor can be used to lighten the mood and distract from the fight.